Yesterday was a bad day to start your diet if you were on McGill’s lower campus. 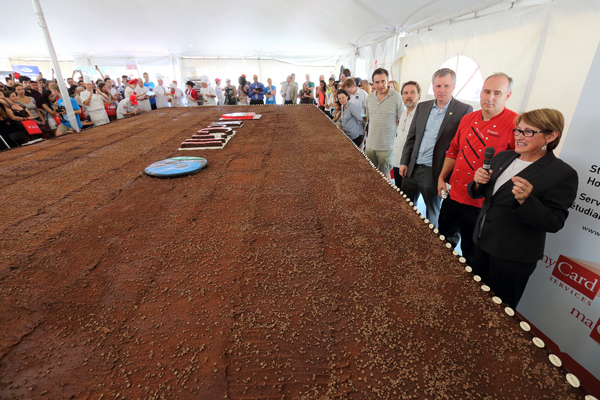 But, if you have any kind of a sweet tooth, it was a day for the record books as the good folks from Student Housing and Hospitality Services whipped up and served a humungous 4,400-pound brownie to the delight of thousands of hungry people. Yesterday was a bad day to start your diet if you were on McGill’s lower campus. But, if you have any kind of a sweet tooth, it was a day for the record books. In what is turning into a real tradition, the people from Student Housing and Hospitality Services (SHHS) helped kick off the fall semester with another feel-good – and taste-great – McGill à la carte event, this time baking the world’s largest Fair Trade brownie. 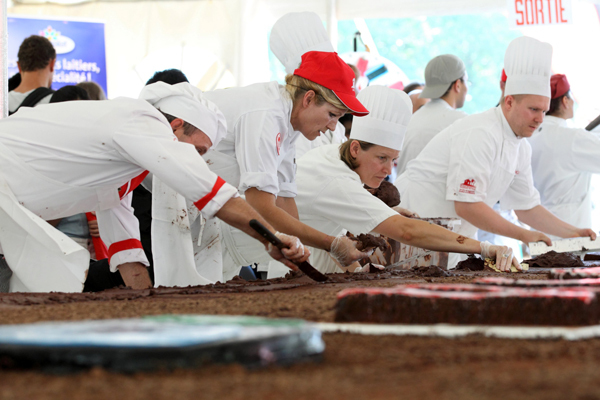 The giant dessert, which was cooked in batches in the kitchens of student residences, was assembled in a tent on the field over a three-and-a-half hour period beginning at noon. When the cocoa powder finally settled, the behemoth brownie topped the scales at 4,419 pounds of cavity-inducing sweetness, or almost 8 million calories. Now in its third year, McGill á la carte has quickly become a flagship event signaling the beginning of a new fall semester at McGill. In 2012, the SHHS team shattered the Guiness World Record for the largest fruit salad by making an 11,197-pound mountain of freshly cut fruit. 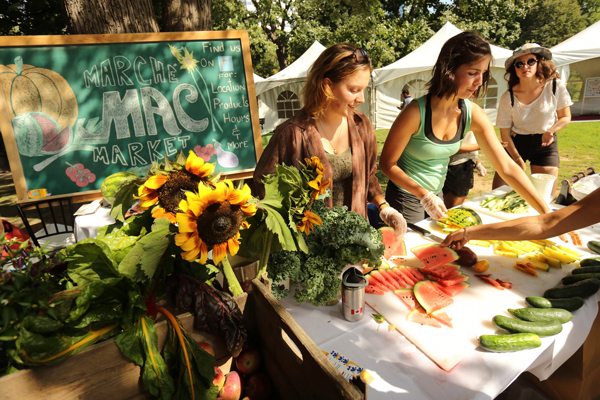 Last year, the team hosted the Tomato Fest in which thousands of people feasted on a five-course tomato-themed meal that included salsa, gazpacho, Greek salad, pizza with fresh tomato sauce and a 500-pound tomato cake. Although he wasn’t asking for more, Laperle and the SHHS team certainly offered more, as the event also featured kiosks of no fewer than 27 of McGill’s food providers who dished out free samples of their fare all afternoon. If two tons of brownie fun was the main course, people were able to whet their appetites on everything from goat cheese canapés, bagels and lox and surprisingly refreshing cucumber smoothies, to fresh sushi and sashimi, boccocini and tomato (grown at Macdonald Campus farm) skewers, and chicken burritos. With people snapping pictures and cheering in the background, Principal Suzanne Fortier makes the first cut. Mathieu Laperle looks on. / Photo: Owen Egan. 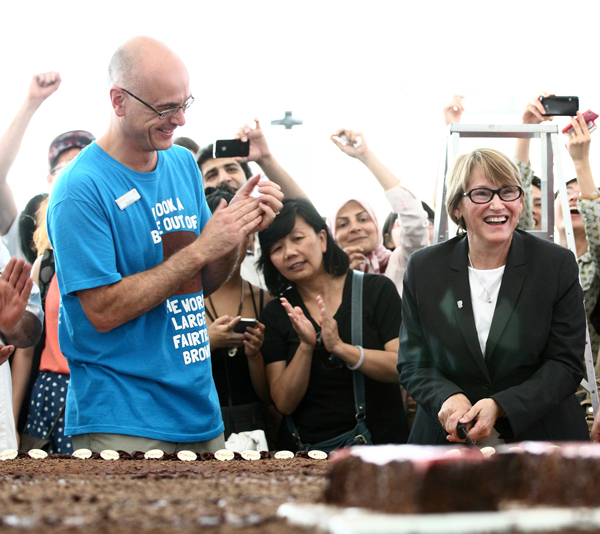 By the time Principal Suzanne Fortier was ready to cut and serve the first piece, the tent was packed with people. 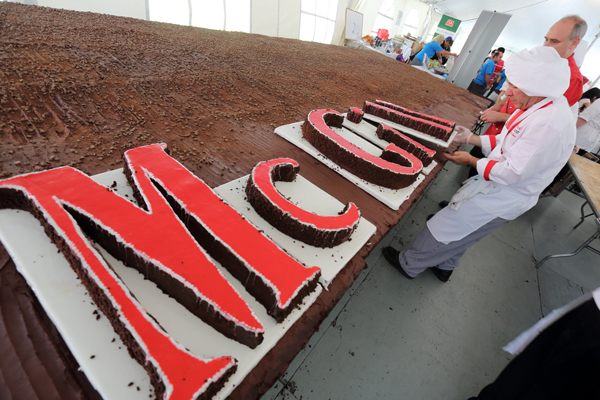 Like the biggest Hollywood celebrity, McGill’s monster brownie was immortalized over and over as people snapped countless selfies in front of the beast on their cell phones and tablets. And while the Principal’s speech was all but impossible to hear thanks to a technical glitch (the only noticeable stumbling block of the day), her smile said it all. Flanked by Laperle and De Volpi, Principal Fortier expertly cut the first piece as Pharrell Williams’ megahit Happy blasted from the loudspeakers, just adding to the party atmosphere. Judging by the hundreds of people dancing, singing and applauding, you couldn’t have asked for a more perfect song.